EquiFund, the new Fund-of-Funds programme in Greece, aims to boost entrepreneurship and create a lasting impact on local businesses, by attracting private funding to all investment stages of the local equity market, ranging from entrepreneurship steps even before the early stage start-ups up to mature expansion companies. EquiFund will be instrumental in unlocking the equity potential in the Greek market and will have a transformational effect in the local ecosystem. And what is the EquiFund event about? 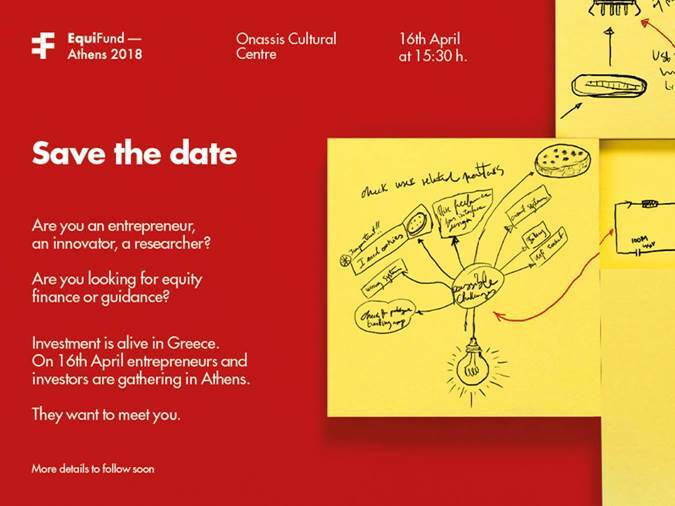 On 16th April, entrepreneurs and investors are gathering at the Onassis Cultural Center in Athens to meet, discuss and exchange ideas and experiences on what equity financing is, how it works and how it can support you transpose your idea into a business! Successful start-ups from Europe and Greece and Fund Managers supported by EquiFund will be there to meet you! If you are a researcher, an innovator, an entrepreneur or simply aspiring to become one, you definitely need to attend the EquiFund event! Save the Date in your calendar… registration information will follow shortly!